Mayor Rahm Emanuel slammed President Donald Trump Monday for debating the crowd size at Friday’s inauguration, urging the Republican to instead focus on jobs and education. "You didn’t get elected to debate the crowd size at your inaugural," Emanuel said after a ribbon-cutting at an Uptown domestic violence shelter. "He got elected to make sure the people have a job, the economy continues to grow, people have a security as it relates to kids' education, etc.," he added. "It wasn’t about your crowd size. It was about their lives and their jobs." The mayor advised Trump to "create a relationship between the desk in the Oval Office and the issues at the kitchen table." He noted that Chicagoans who attended Saturday's Women's March were talking about jobs, education, health care and security, not the size of Friday's inaugural crowd. The mayor claimed the answer to the city's ongoing violent crime crisis lies in giving officers the training, supervision and “certainty" they need for pro-active policing. Emanuel warned against returning to the controversial stop-and-frisk tactics favored by Trump. “If you look at the last year across the country and then say, ‘The only answer is to go to stop-and-frisk. That’s it,’ that’s not where the world is today,” Emanuel said. "We need our police to have high professional standards, the training to support them in those high professional standards and the certainty to be proactively involved," he added. Earlier this month, the U.S. Department of Justice issued a report that found the Chicago Police Department violated constitutional rights by engaging in a “pattern or practice of use of excessive force.” The DOJ’s 13-month investigation was sparked after dash-cam footage of the 2014 police-involved shooting of Chicago teen Laquan McDonald was released in November of 2015. On Monday, the mayor claimed there's a reason why homicides and shootings are also surging in other American cities, like San Diego, San Antonio, Indianapolis, Memphis and Baltimore. "Clearly, there was a reaction to what happened accross the country," Emanuel said. "On the other hand, the choice isn't just go back to stop-and-frisk." In November, the Chicago Police Department announced the bold “Be the Change” campaign that aims to add 970 officers over a two-year period. Emanuel acknowledged that the success of the hiring blitz ultimately relies on the department's policing policies Monday. "If police step back and adopt a more reactive mode, you’re going to end up with the only winners in that process are gangs," the mayor said. 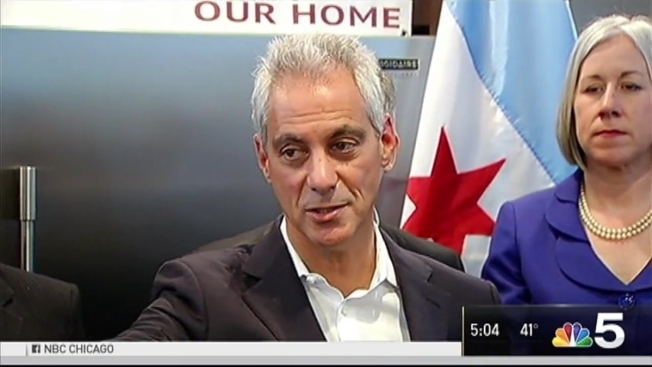 Emanuel also renewed his call for stiffer sentences for repeat gun offenders Monday. “If you use a gun in New York, three-year minimum for that crime,” Emanuel said. “In Illinois, it’s one year. And don’t think for a moment gang members don’t know there’s not a penalty for using a gun."